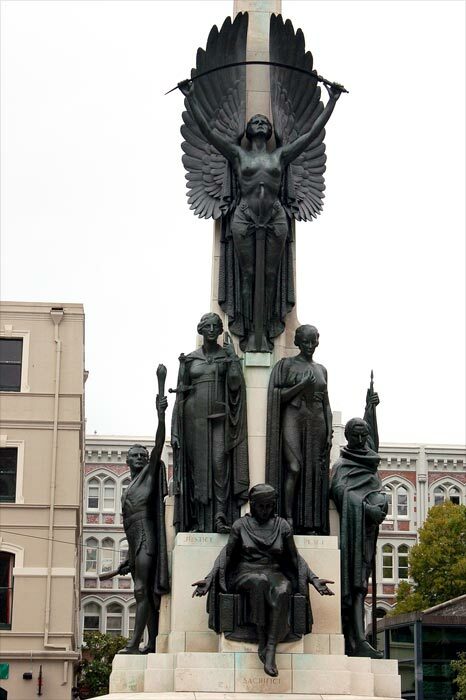 William Trethewey's most ambitious work was the Christchurch Citizens' War Memorial, unveiled in Cathedral Square in 1937. A First World War memorial was originally proposed in 1919, and it was finally completed very close to the outbreak of the Second World War. It consists of a group of allegorical figures: the centrally placed mourning figure of Sacrifice, flanked by Youth holding a torch, a blindfolded Justice holding scales, Peace with a dove and olive branch, and Valour in the armour of St George. Towering over them is a winged female figure representing Victory breaking the sword of battle. Although critical opinions about the merits of the work vary, there is no denying that it is impressive in conception and scale.